Provided photo Children are invited to participate in about 20 different art projects sponsored by local organizations, clubs and churches during the Art in the Park and Children’s Art Adventure. TIPP CITY — This year, two of the Tipp City Area Arts Council’s summer events will be combined into one big, family-friendly celebration of local art. The annual Art in the Park and Children’s Art Adventure events are teaming up for a joint event on Saturday, Aug. 4, in City Park. 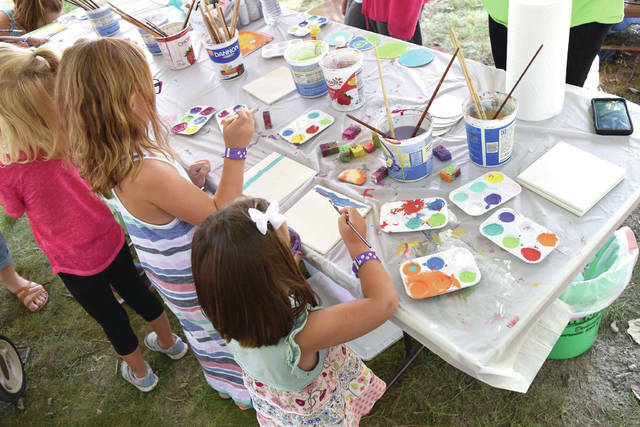 Both events are free and open to the public from noon to 8 p.m., with activities for kids from noon to 4 p.m.
Art in the Park is a celebration of area artists, Arts Council board president Lynn Shirk said. It will feature all types of art including visual and performing arts, as well as culinary art represented by several local food trucks, Shirk said. “This is really about promoting our local artists,” she said. The event will include area art vendors and demonstrations from a variety of artists, as well as live music. Culinary options at the event will include ice cream from the music boosters, Kona Ice, local food trucks Sam & Ethel’s and Loafin’ Around, and kettle corn. “It’s an ice cream social with a modern day twist,” Shirk said. Visitors are encouraged to bring their own lawn chairs and enjoy a full day of art, music and food in the park. The Tippecanoe Community Band will kick off the live entertainment at noon, followed by performances every two hours from Side FX, Simply Joseph and Soul Express. Children’s Art Adventures is a fun way to expose kids to different kinds of art, with activities for kids running the gamut from a hair coloring booth and face painting, to hands on arts and crafts, Shirk said. The booths are all sponsored by local groups, including the Girl Scouts and Ginghamsburg Church. “We have the Skull Dolls coming. They are awesome face painters, the best one’s I’ve ever seen,” Shirk said. In previous years, the various children’s art events were not free. This year the arts council received a grant from the Miami County Foundation. “It’s totally free of charge this year,” Shirk said. For more information about the event, visit www.facebook.com/artintheparktippcity. https://www.weeklyrecordherald.com/wp-content/uploads/sites/51/2018/07/web1_art-adventure.jpgProvided photo Children are invited to participate in about 20 different art projects sponsored by local organizations, clubs and churches during the Art in the Park and Children’s Art Adventure.